All transactions are safe and secure with a reliable history in online purchasing behind each of our associates. Buy the Friday the 13th Days of the Week t-shirt to own Friday the 13th clothing and merchandise. In this design, Jason Voorhees is conveying his general mood for each day of the week. This Friday the 13th tee is a creative tribute to the movie franchise. Perhaps Crystal Lake's machete wielding maniac will hack you into fewer pieces if he sees that you are wearing a stylish Jason Voorhees t-shirt. On second thought, we could be wrong but it's better to be safe than sorry, especially if you're visiting Crystal Lake on the 13th of the month and it happens to be the last day before the weekend. Get it with a Freddy design for a horror combo. 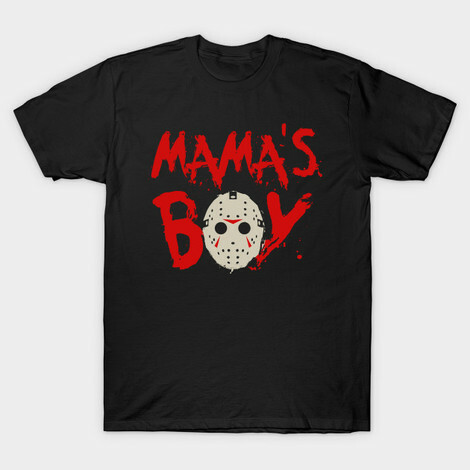 In addition to the Friday the 13th Days of the Week tee above, browse the Friday the 13th Clothing Gallery for more apparel like men's and women's clothes, kids shirts or hoodies.